This is a true Kitty’s Store-Cupboard recipe – quick, easy and cheap. I have had feedback recently that people miss my £5 a week challenge which I started in January last year. It probably hasn’t come across well in recent posts, but one of the things which I am passionate about is demonstrating how it is possible to cook very delicious and wholesome meals from a well stocked store-cupboard and a small weekly shopping bill. This dish is one which I made up on the spur of the moment earlier this week… and by ‘spur of the moment’ I mean that I changed the whole direction of the dish half way through my cooking session! It started off as a pasta sauce recipe, but when I realised that I had run out of pasta it morphed into a lentil and bean based dish. Note, I was in the mood for something strong tasting when I made this so I used a whole tin of anchovies. You may want to start with half the amount. Also, if you are not a fan of fish then bacon is a good substitute. Heat approximately a tablespoon of oil (I tend to use rapeseed oil) in a medium sized frying pan. Add the onion, garlic, mustard seeds, herbs and paprika and gently fry until soft. Next, halve the anchovies and add them to the onion mixture. Add the pre-cooked lentils & beans and the tinned tomatoes. Simmer for approximately ten minutes and then serve topped with grated cheese. Yummy with rice or crusty bread. I am almost exactly a month into my life as a food blogger, and I have to say that this is definitely the most difficult post that I have written so far. Those of you who have been following me for the last month will know that I set myself a challenge at the beginning of January to ‘cook using only what I already have in my cupboards and freezer, plus what I can buy for £5 a week’; you will also know that I like to communicate what I have been cooking with minimal ‘waffle’. Now that February has arrived it is time to reflect on my January Challenge and I really hope that I can do so in a concise and interesting way. Please leave me a message if you make it all the way to bottom! Most importantly, I must say that I have really enjoyed giving myself a ridiculous budget for a month; it reminded me of how much fun it is to be creative with my cooking, and in addition it ‘reset’ my shopping habits and prevented me from producing any food waste. What I would really like to get across to you is how well you can eat on a small weekly budget if you keep a few ‘core’ things in your storecupboard. If you are not used to this style of food shopping and cooking then there will be some upfront expenditure (but not much, see below how much I spent on topping-up my cupboards at the end of the month); but once you have initially stocked up there will just be a small ‘rolling cost’ as you replace things. What did I buy with my £5 a week? My first £5 was spent on onions, carrots, mushrooms, some good British sausages, a lime & soda from my local pub, and some reduced bread for my freezer. Lesson #1 – lime & soda is totally pointless and a waste of money! During the second week I spent the princely sum of £4.88 on free range eggs, carrots, new potatoes, frozen peas and a British lamb shank. Lesson #2 – a box of mixed-sized eggs is considerably cheaper than buying a box of identical eggs, and unless you are doing high-precision baking they are just as good. For the last couple of weeks of the challenge I was more ‘bitty’ in my shopping (I didn’t have time for a ‘big’ £5 shopping trip!) and I was not quite so disciplined in writing up what I had bought; in summary I topped up the onions, potatoes, mushrooms and carrots, and I had a cup of tea at a church coffee morning for a whole 80p – decadent! What are my new favourite recipes? As I mentioned above, one of the best things about giving myself a ridiculous budget was re-discovering my creative ‘make-it-up-as-you-go-along’ cooking flair! I think that my favourite was probably the Roasties with Garlic & Coconut Dip – this was a very spur of the moment ‘snack’ using some coconut yoghurt that a friend had left in my fridge, I will certainly be making it again. If I had to choose another top creation it would be a difficult choice between the vegetable curry and spaghetti with tomatoes and poached egg. Lesson #3 – if you don’t allow yourself to ‘pop to the shops’ for additional ingredients you will discover new and exciting (or sometimes just ‘interesting’) recipes! Please do let me know what your favourite recipe has been so far, and do do do give them a try and let me know how easy or otherwise they are to follow! What did I run out of? Despite making a show of being organised, I actually managed to forget the shopping list when I went for my ‘top-up shop’ – so in the end I forgot a few things, got a few extra things, and spent about £30 (including the gin). Not bad. What is in Kitty’s Storecupboard? Having set myself a ridiculous budget for a month I have concluded that the following constitute the ‘core’ storecupoard ingredients which I would be hard-pressed to do without (although I’m sure I’d cope! ); I hope that I have demonstrated over the last month that very little is needed in addition to these things to cook some rather delicious meals. What can I say? A picture says a thousand words! oregano, or some kind of mixed green herbs. Garlic and onions are also very important! … and for my next challenge? I’ll keep you posted. In the mean time I have a number of January recipes to share with you which I ran out of time to write last month. Well done for getting to the bottom of the page! This fed two adults and a child (approximately 1/2 a tin of tomatoes per person and an egg each). If I had them I might also have included bacon or anchovies, olives or capers. Fry the onion, garlic, black pepper and herbs in olive oil until beginning to soften. Add the tinned tomatoes, tomato puree and mushrooms and simmer until the mushrooms have cooked. While the sauce is simmering away put the spaghetti on to cook, following the instructions on the packet for the quantity and cooking time. When the pasta is nearly done crack an egg into a mug, make a little well in the sauce and pour in the egg; repeat so that there is one egg per person. Note, if your pan is not non-stick you will probably need to put a bit of oil in each well before you add the egg. After about a minute, turn each egg with a spatula and then sprinkle the cheese over the sauce. Drain the pasta and divide between shallow bowls. 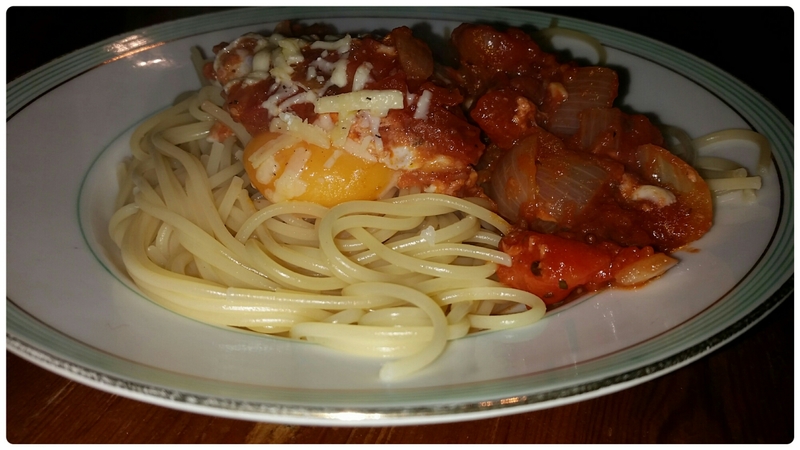 Put an egg onto each serving of pasta and then share out the rest of the sauce.